i Click 'view all' to instantly compare this ok deal with offers on other top card games. Dos Tin Card Game - Amazon Exclusive is currently selling at $9.99, approximately $0.01 higher than average. With a lowest price of $9.87 and an average of $9.98 it is selling on the high end of its usual range. Price volatility is 0.59% (meaning it does not change often), so you might have to wait a while for the price to drop. Right now this product is a recommended 'ok deal'. Compare the current price, savings (in dollars & percent) and Buy Ratings for the top Card Games that are closely related to Dos Tin Card Game - Amazon Exclusive. Here is how Dos Tin Card Game - Amazon Exclusive compares with other leading Card Games. UNO has a new best friend, dos! in this fun card game, two is more important than one, and number matching is King! just like UNO, dos involves a race to be the first to get rid of your cards. To start, there are two discard piles between the players. On each player's turn they can discard on either pile with either one or two cards, so if a player has two cards that add up to the number of a card in the center pile, they are able to put down both cards. 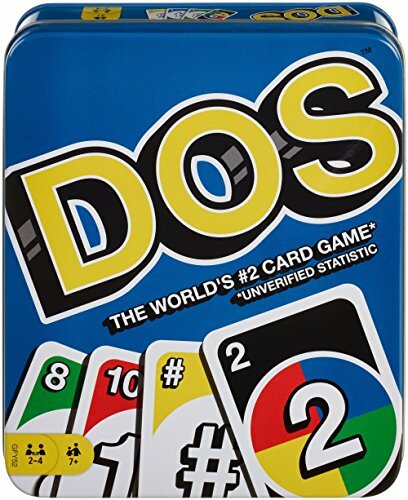 When you're down to two cards, don't forget to yell "dos!" the first person to 200 points is the winner! the game includes a 112-card deck plus instructions. For 2 to 4 players. Ages 7 and older. Colors and decorations may vary. FeaturesThis exciting card game invites two to four players to challenge each other as individuals or as teamsThe goal is to be the first to get rid of all your cards, and special wild cards change the gameplayMatching numbers is most important, but get bonus points for matching colors as you race toward a score of 200If you go out first, you earn points for cards left in your opponents' hands!